East or West – Which Side (Of London) Are You On? For many Londoners the east-west and north-south divide still runs strong and the debate on which is the best side of the river is as alive as ever. In the last year alone, price growth in Hackney, Tower Hamlets, Lewisham, Greenwich and Newham has outperformed the more traditionally, expensive boroughs of Westminster, Kensington and Chelsea1; a key factor for some when it comes to putting down roots for the first time. 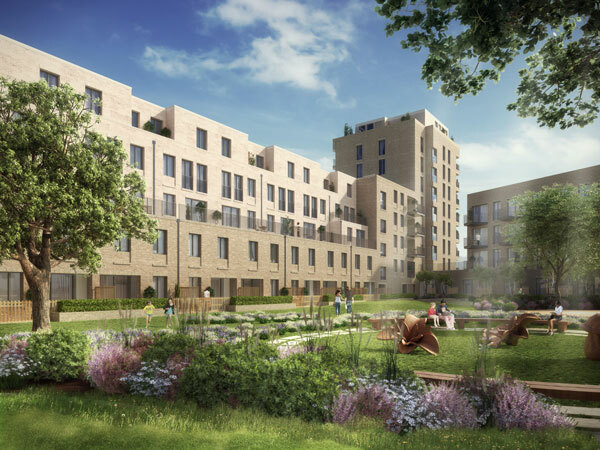 Luckily for Peabody buyers, there is something for everyone with two new schemes from the award winning housing provider. 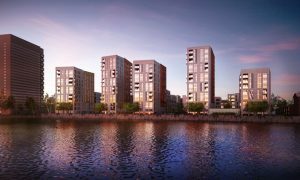 With almost a third of new homes in London set to emerge in the East End over the next five years2, it’s no wonder east of the city has become a hotspot for those looking to get on to the property ladder. 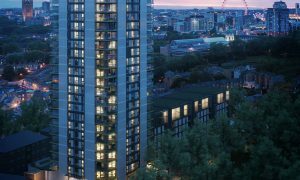 One such trend setting borough is Tower Hamlets, where Peabody’s flagship development, Merchant’s Walk (pictured above), offers a collection of studio, one, two and three bedroom apartments in the heart of E3. 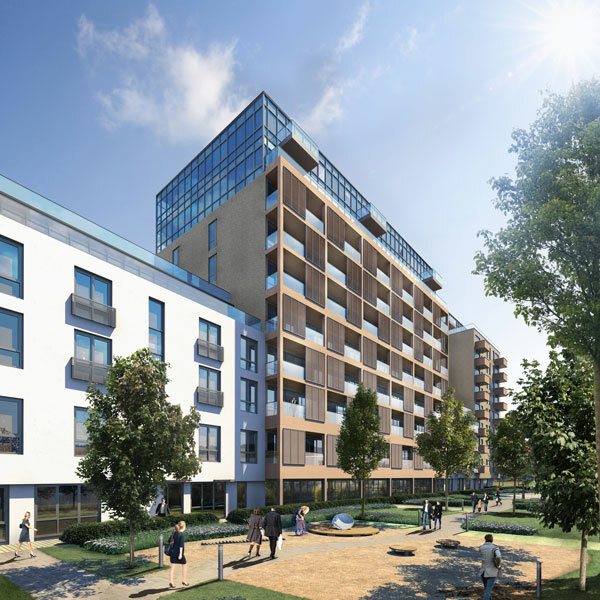 With the average price of an apartment in Bow priced at £370,6333, buyers at Merchants Walk can step on to the property ladder from just £325,000. Each apartment features light and airy living spaces with high specification finishes and private outdoor space. This stunning new development also offers extensive landscaped grounds, cycle storage, car club spaces and secure car-parking. Situated between Canary Wharf and the Olympic Village, this new development is ideally located adjacent to Devons Road DLR and around a 10-minute walk to Bromley-by-Bow tube station. 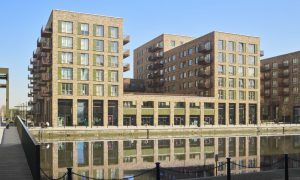 City workers can enjoy a quick and easy commute as well as a lively urban lifestyle in the peaceful surroundings of the Limehouse Cut and the Lea Valley. With Westfield Stratford City, Queen Elizabeth Olympic Park, Roman Road Market and Victoria Park all close by, Merchant’s Walk is perfectly placed for home owners to enjoy the very best of east London living. A welcoming prospect for buyers in Kensington and Chelsea, More West (above) provides new one, two and three bedroom apartments starting from £626,500; less than half the cost of last year’s local average price of £1,373,1354 for an apartment on the open market. Ideal for young professionals and families alike, buyers can also take advantage of stamp duty fully paid on selected plots. Designed by award winning architects, Haworth Tompkins, all homes enjoy private balconies, contemporary high-gloss kitchens and fully tiled bathrooms, making them beautiful urban living spaces. Whether you are travelling on foot, by bike or car, or on public transport, it’s easy to make the most of the great things west London has to offer at More West, located on Latimer Road. From homemade British pub-grub at Defector’s Weld to Caribbean-style beach shack vibes Rum Kitchen, some of the best food and drink in town is just a stone’s throw away. Plus, with Portobello Market, Electric Cinema, Serpentine Galleries and Hyde Park all close by, this development is certainly one for the culture vultures. To register your interest in the new homes please call the sales team on 020 7758 8431 for More West or 020 3369 8684 for Merchants Walk. Alternatively, email enquires@peabodysales.co.uk. Affordable Homes That Will Inspire You!